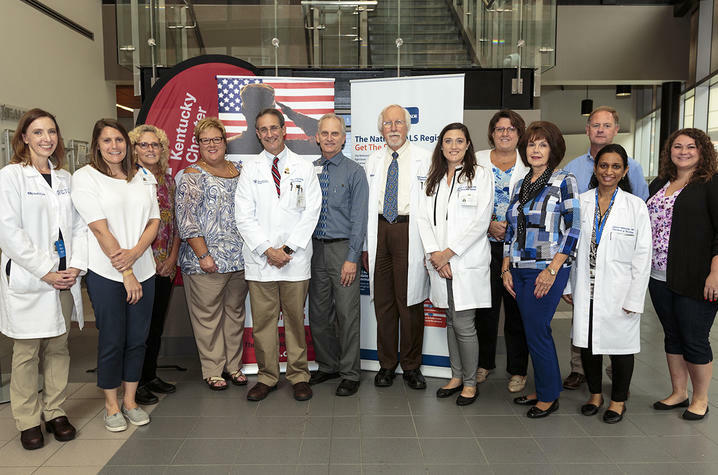 Members of the multidisciplinary team at UK HealthCare's ALS Clinic which has been named a Certified Treatment Center of Excellence by the ALS Association. LEXINGTON, Ky. (June 13, 2018) – ALS, or amyotrophic lateral sclerosis, is a neurodegenerative disease of some fame in the United States. Many Americans know the illness, which currently has no cure, as Lou Gehrig’s disease, after the beloved baseball player whose career and life were cut short by the condition in the 1930s and 40s. More recently, renowned physicist Stephen Hawking died of ALS. Perhaps more than anyone else, Hawking reminds us of the particular cruelty of the disease, which slowly robs a person of muscle movement while leaving their cognitive abilities intact. The average life expectancy after diagnosis is only four to five years, and nearly everyone with ALS ultimately dies from the inability to breathe. With around 6,000 new cases diagnosed annually, ALS is the most common motor neuron disease in the U.S. About 90 percent of cases are sporadic—without genetic cause—but the remaining 10 percent of cases are familial, caused by a genetic variant passed down from parent to child. It was only in the 1990s that researchers first identified a gene involved in familial ALS, the SOD1 gene, which still appears to be the most common genetic variant in the U.S. and western Europe. More than 16 other genetic variants have since been identified, sometimes with specific regional distributions. Kasarksis came to discover a cluster of ALS cases caused by a mutation in the FUS gene, which regulates MnSOD, the major antioxidant defense enzyme located in the mitochondria of motor neuron cells. People with this specific FUS mutation don’t have enough of the MnSOD enzyme, which means their motor neurons in the spinal cord break down from oxidative stress and become unable to carry messages from the brain to the muscles. The collaboration between Kasarskis and St. Clair precedes the TRANSLATE study, and also began through a stroke of coincidence. While the FUS gene was identified as a cause of familial ALS in 2009, St. Clair’s work had already demonstrated the FUS protein was involved with the MnSOD enzyme, though she hadn’t connected it to ALS. The TRANSLATE study, which is supported by the UK Multidisciplinary Value Program, had its roots in this overlap. The team screened hundreds of FDA-approved drugs that could potentially increase the antioxidant capacity of cells. The screening process stemmed from a project in St. Clair’s lab at the UK Markey Cancer Center, where she was trying to find drugs that were nontoxic and whose antioxidant properties could reduce side effects of cancer therapy. “During the screening process, we found that one drug being used extensively is betamethasone. It’s used in all kinds of inflammatory diseases, it’s very non-toxic so you can give short-term, high doses without problems for patients, and it has a long history of use for other conditions. And that’s how the TRANSLATE clinical trial began,” St. Clair said. In the trial, participants with FUS-related ALS are given doses of betamethasone via injection; later, blood and antioxidant measurements are taken to see if the intended effect has been achieved. The research team is hoping to enroll ten participants who have active FUS-related ALS or are carriers. After proving the research concept, the team will determine if this approach could benefit patients with other types of ALS. This study is funded by the UK Multidisciplinary Value Program, which is supported by the UK College of Medicine, the Office of the Vice President for Research, and the UK Center for Clinical and Translational Science.